How much is a dozen and a baker's dozen? 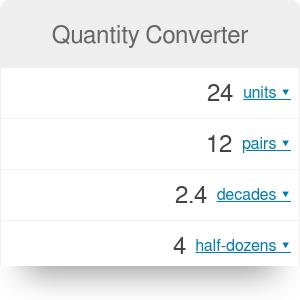 Our quantity converter will help you find out how much is a dozen or how many half a dozen are in a score. Choose between nine different quantity units and find the answer in a blink of an eye. If you curious about baker's dozen origin or you are looking for a conversion table for a dozen, a gross, and a score, keep scrolling! Ask for a dozen or eggs, pencils or cookies, and almost certainly you will receive 12 chosen items. However, the baker's dozen measure also exist, and it's sometimes called devil's dozen, long dozen, or long measure. The baker's dozen is one more than the regular dozen, so it's a grouping of 13. Baker's dozen measure comes from medieval England. The law was strict for bakers and for overpricing the bread you could get hefty fines and floggings. As it's difficult to obtain baked goods in the same size and weight every time, bakers decided to add one extra item, just in case. They prefer to throw a bit extra than to risk the penalty - sometimes they even added one more product, and the customer ended with 14 items buying a dozen. Originated in Mesopotamia, a dozen is one from the oldest grouping measure. It's a convenient number as it has many divisors (1,2,3,4,6,12). The dozen probably comes from twelve cycles of the moon or the number of months in a year. Twelve is a base number in the duodecimal system and is sometimes used in imperial measures (e.g. 1 foot = 12 inches). Twelve dozens are called a gross (12² = 144); a dozen gross is known as a great gross (12³ = 1728), a term used in wholesale trade. Enter the value you want to convert into the correct box. In our case, it's scores box. Type 25. The values in the other eight units appear. Find the measure you need. The quantity converter calculated that there are 41.7 dozens in 25 scores. Quantity Converter can be embedded on your website to enrich the content you wrote and make it easier for your visitors to understand your message.